Following Andrea Bocelli’s recent smash-hit release ‘Cinema’, the award-winning, top-selling, international tenor returns to his first love, singing opera. One of the world’s best-loved operas, Aida has been performed over 1,100 times at New York’s Metropolitan Opera alone. Through an opera of high dramatic tension, Verdi offers monumental scenes and intimate drama. Taking the lead male role of Radamès – an Egyptian military commander – Bocelli’s powerful tenor tells a compelling story of dedication, intrigue, power, and intense love. 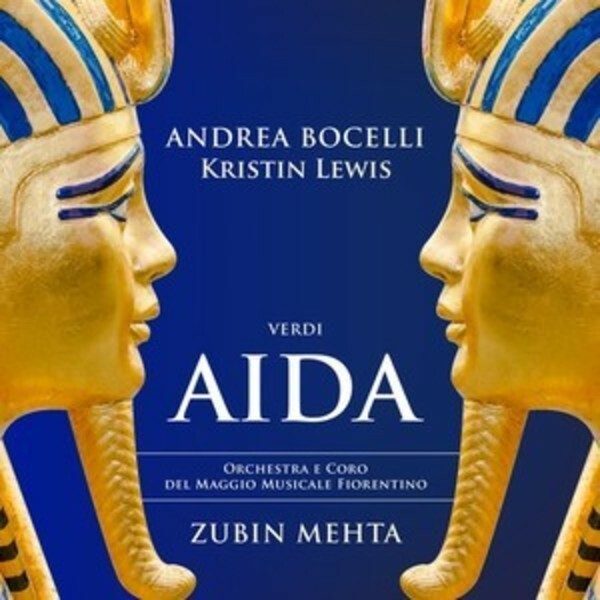 In this eagerly-awaited complete opera recording from superstar Andrea Bocelli, the tenor assembles a fine cast to explore Verdi’s most spectacular work: the award-winning American soprano Kristin Lewis takes the role of Aida, the brilliant Italian mezzo Veronica Simeoni as Amneris. Giorgio Giuseppini takes the role of Il Re (the Egyptian King), the powerful Ambrogio Maestri (‘Italy’s answer to Bryn Terfel’) as Amonasro and Carlo Colombara, renowned Verdi bass, as Ramfis. Zubin Mehta conducts a spectacular performance from the Orchestra and Choir of the Maggio Musicale Fiorentino; one of high dramatic tension, theatricality, and deeply resonant passion.